Where you host your source code affects how much you can streamline workflow. Developers rely on app integration tools to better manage projects, from issue tracking to live chat. We’ll take a look at how these products supplement your coding capabilities with extensions. GitHub has over 92 third-party integrations available, many of which are GitHub-exclusive. For example, QuantifiedCode scans for issues in your code, notifies you of any problems, and automatically offers a fix for you to approve. A major principle to engineering a successful enterprise is to design business structure as a united and integrated whole. But GitHub’s integrations are all third-party. It even integrates with popular Atlassian apps, like JIRA. As a stand-alone product that relies solely on outside developers for extensions, GitHub doesn’t offer the unifying compatibility of a product suite. It requires familiarizing yourself with a new app provider every time you install. Bitbucket seamlessly integrates with other Atlassian software like JIRA, HipChat, and Bamboo. 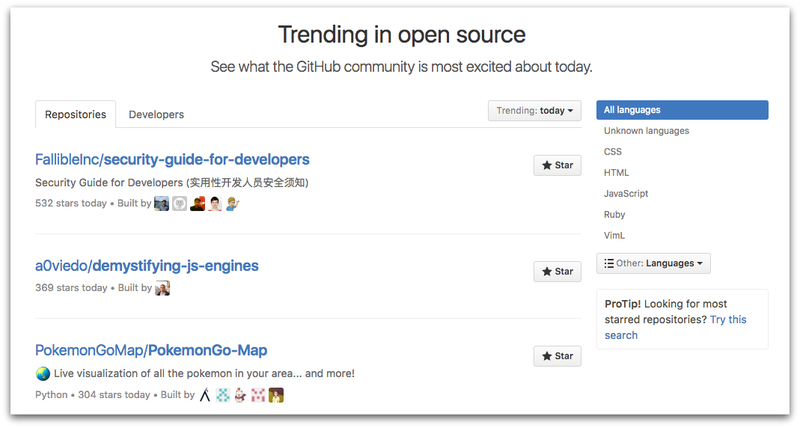 It also has a distinct quantitative advantage over GitHub — the Atlassian Marketplace. Users can choose from nearly 2,300 apps — made by Atlassian, third-party developers, and individuals — to upgrade not just Bitbucket, but also its Atlassian sister products. Atlassian has designed for cross-product compatibility. This is a huge implementation advantage for enterprises. Developers familiar with Bitbucket will have an easier transition into Atlassian tools made to complement it. Going directly through Atlassian eliminates the time spent training employees on outside systems. You get tools pre-built for deep integration with your repository host. Tapping into the developer community can be a powerful resource for your company. Releasing proprietary code as open source may seem like giving trade secrets away. But iconic companies have leveraged the power of independent developer talent to improve their product or used open source to draw positive public attention to the brand. Let’s examine the size and nature of the communities behind GitHub and Bitbucket’s public repositories. GitHub is the largest host of source code in the world. It boasts over 14 million users, over 35 million repositories, and a long history of being an open source haven. GitHub has always offered unlimited free public repositories, only incorporating unlimited private repositories to paying customers this year. Some notable companies that host open source projects on GitHub include Facebook, NASA, and Google. Bitbucket has nearly 3 million users as of 2014. This doesn’t really compare to GitHub’s massive user base, but Bitbucket has never presented itself as an icon of the Open Source Movement either. People do use Bitbucket to host open source projects. However, the service has traditionally tailored itself towards helping enterprise developers with private proprietary code, especially since being acquired by Atlassian in 2010. The sheer number of people using GitHub is why it takes this category. Whether it be for exposure or opening your product to community involvement, you’ll reach far more developers with GitHub. If you’re an enterprise company buying repositories in the cloud for hundreds of employees, price is a major concern. If your I.T. department is ready to host your code on-premise, you’ll need an enterprise plan that doesn’t break the bank. 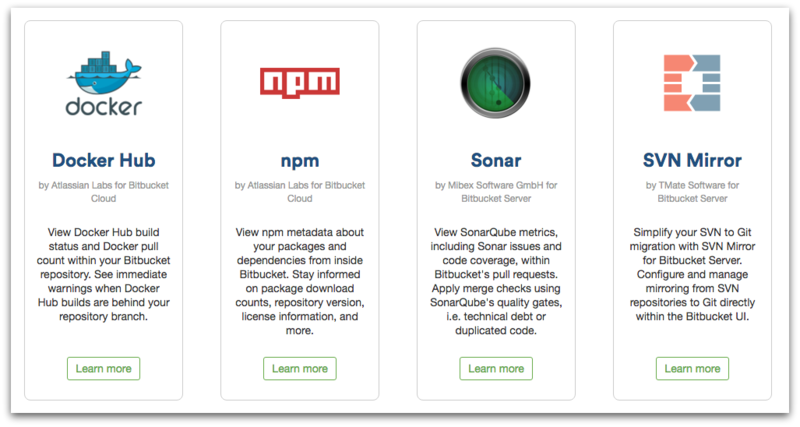 We’ll compare how Bitbucket and GitHub price their hosting service for cloud and enterprise. GitHub’s cloud pricing for organizations is $9 per user per month. It is much more expensive compared to Bitbucket Cloud’s pricing plan, which is tiered by number of users. Bitbucket increases price at certain thresholds of users, which are 10, 25, 50, and 100, priced at $10, $25, $50, and $100 respectively. At 101 users, the price becomes a flat $200 per month and allows for unlimited users afterwards. 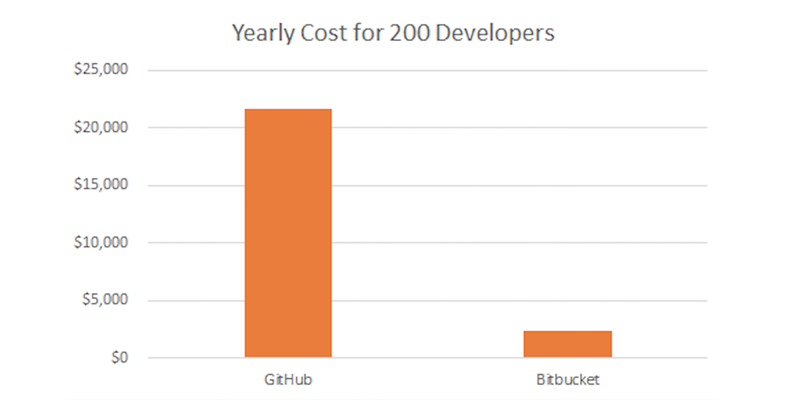 For a team of 200 developers to host repositories in the cloud for 12 months, it would cost GitHub users $21,600 and Bitbucket users $2,400. That’s a 9x difference. Enterprise plans allow companies to run their own servers to host source code. Enterprises often forego cloud hosting for greater control over their repositories. GitHub Enterprise costs $2,500 per 10 users per year. Packages can only be purchased in seats of ten, so even if you only have 11 team members, you’ll be paying the same as if you had 20. Bitbucket Server is priced in tiers like its Cloud counterpart, with a 2,000 user maximum. Additional users can be added by buying Atlassian’s Data Center, which must be renewed with an annual license. The user thresholds are 25, 50, 100, 250, 500, 1,000, and 2,000. Pricing starts at $1,800 for 25 users and ends at $48,000 for 2,000. Adding users via Data Center will cost an additional $24,000 per 1,000 users. Again, GitHub’s per-user model results in greater expense. An enterprise could run a five-year team of 1,000 developers on Bitbucket at a tenth of the price of GitHub! Bitbucket wins because it offers equal functionality at 10x cheaper the price. When you buy GitHub, you are paying for its storied open source community, but that isn’t enough to justify charging a huge price tag to help enterprise companies host proprietary code. All the money you save on hosting could be invested into your actual product instead. Bitbucket isn’t the most popular kid in class. But when it comes to hosting repositories at enterprise scale, Bitbucket stands toe-to-toe with GitHub. Its seamless integration with other Atlassian products keeps tools aligned and unifies processes. 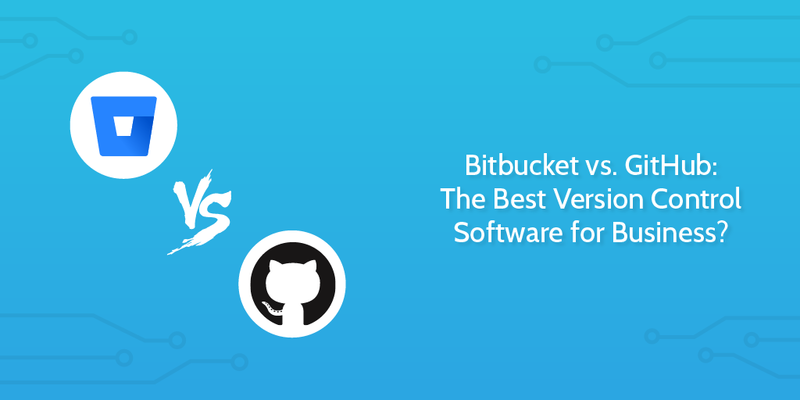 Plus, Bitbucket can serve enterprises with on-premise hosting at a tenth of GitHub’s price. If you’re looking for a cost-effective repository host to supplement your coding capabilities, choose Bitbucket. Would love to see how http://gitlab.com fairs in this battle. Gitlab is so f*** slow it borders on useless. Both page refresh and push/pull times are beyond reasonable. Maybe it runs faster if you pay for it? Thanks for the update Sean. Awesome to hear Bitbucket continues to grow and that you guys are constantly improving the product. Great blogpost. Absolutely love the great comparison (and it’s great to know we made the right choice). One thing I would add: The graph for pricing vs developers. It would be great if that wasn’t a bar chart with a fixed number of developers. 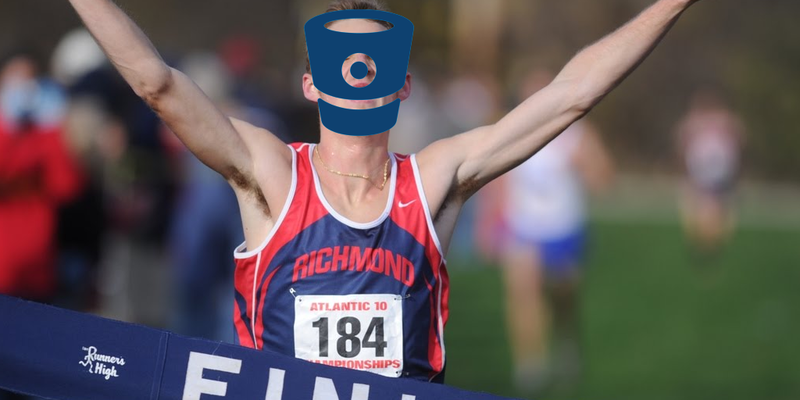 Although Bitbucket would still be the clear winner. Yet the GitHub still favorite! I will share your comparison with my colleagues! Very interesting. Our company just finished evaluating the choices and went with github. I do wonder what drove that decision. The price increments of the individual products are not included, but this is a battle that atlassian will win too. Not sure about which years it increased but i am sure about the amounts. Yes, one could blame inflation, but a Burger King Whooper costs about the same amount of money now as 10 years back, and they managed to keep the price this low without a 300-400% growth, go figure. I don’t know about GitHub, but BitBucket’s Cloud service availability is very very bad. It very often happened that our developers were stuck because they could not push the code or that the builder could not pull the code.